It is not surprising that friends of the Enlightenment tend to assume that the Enlightenment was generally friendly towards the American Revolution. Richard Price had, after all, been an energetic supporter of the Colonial cause and, like Joseph Priestley, saw it as a link in the chain of “glorious revolutions” that stretched from 1688, through 1776, to 1789. Pierre-Augustin Caron de Beaumarchais spent several crucial years figuring out ways of getting weapons to the American revolutionaries. There was also considerable interest in the revolution in German-speaking Europe. The Basel Aufklärer Isaak Iselin translated the Declaration of Independence for the October 1776 issue of his journal Ephemeriden der Menschheit (a translation of a text by John Adams followed in a later issue). And, between 1787 and 1788 the Berlinische Monatsschrift devoted three articles to the recently enacted Virginia Statute for Religious Freedom. If the ministers of Great Britain had known the truth about the situation in its colonies, they would indisputably have acted differently. If the colonies had acted without deception, they would not now be a sort of anarchic state that maintains itself through weak bonds without any majesty, a state whose constitution is without true inner greatness and without the force that a well-ordered state ruled by a sovereign must have. Every province is sovereign, and so every province is by itself powerless! There is no spirit of harmonious unity, and everywhere there are false concepts of freedom! But the most relentless critique of the American declaration came from a thinker with impecable creditials as a radical enlightener: the great Jeremy Bentham. 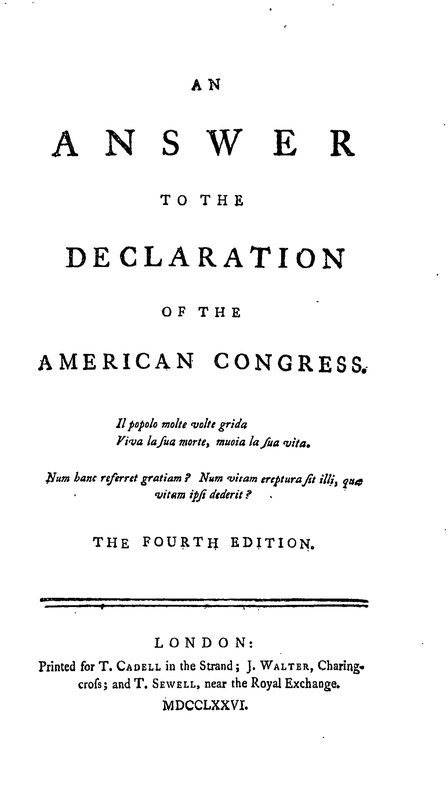 That Bentham’s critique is not as familiar as it deserves to be (and here I should record my profound thanks to David Armitage for calling it to my attention) stems from its having appeared not under Bentham’s own name but, instead, as the final chapter of John Lind’s Answer to the Declaration of the American Congress (1776). In a better ordered world, John Lind (1737-1781) would have been the subject of a BBC miniseries: his life appears to have been considerably more interesting than that of the dim-wits who populate Downton Abbey (in what follows I lean rather heavily on H. L. A Hart’s “Bentham and the United States of America,” Journal of Law and Economics 19:3 (1976): 547–67). He first enters the historical record as the Anglican chaplain in the British legation at Constantinople. But, after becoming “too agreeable” with the Ambassador’s mistress, he was sacked and, leaving the clergy (after all, isn’t the opportunity for “familiarity” with superiors’ mistresses one of the perks of the job? ), he returned to London, and began a career as a lawyer and pamphleteer. As the situation with the colonies worsened, the British government made increasing demands on his skills as a propagandist: between 1775 and 1766 he turned out a series of small books attacking the actions of the colonists. Lind was also a friend of the young Jeremy Bentham, who lived in Lind’s house at the time of the composition of Lind’s Answer and was recruited into writing the book’s final chapter. While the rest of Lind’s Answer — which marched, article by article, through the Declaration — probably deserves more attention than it gets, Bentham’s concluding summary is in a class by itself: sardonic, ruthless, and unfailingly adept at finding the weakest points in the colonial case (though, unlike other critics, Bentham was curiously silent here on the great hypocrisy of the Declaration: a document signed by slaveholders that protests their potential enslavement by the home government). In the transcription that follows (which, I fear, probably contains a few errors that, I trust, readers will point out) I have made a few minor changes in the use of commas but retained Bentham’s sometimes peculiar sentence structure and flamboyant use of emphasis. All of the footnotes (which, for the most part, refer to the particular grievances voiced by the American rebels and discussed, at length, by Lind in the earlier part of the book) are Bentham’s. I’ve indicated, in parentheses, where the page breaks fall. IN examining this singular Declaration, I have hitherto confined myself to what are given as facts, and alleged against his Majesty and his Parliament, in support of the charge of tyranny and usurpation. Of the preamble I have taken little or no notice. The truth is, little or none does it deserve. The opinions of the modern Americans on Government, like those of their good ancestors on witchcraft, would be too ridiculous to deserve any notice, if like them too, contemptible and extravagant as they be, they had not led to the most serious evils. In this preamble however it is, that they attempt to establish a theory of Government; a theory, as absurd and visionary, as the system of conduct in defence of which it is established is nefarious. Here it is, that maxims are advanced in justification of their enterprises against the British Government. To these maxims, adduced for this purpose, it would be sufficient to say, that they are repugnant to the British Constitution. But beyond this they are subversive of every actual or imaginable kind of Government. They are about “to assume,” as they tell us, “among the powers of the earth, that equal and separate ( 120 ) station to which” — they have lately discovered — “the laws of Nature, and of Nature’s God entitle them.” What difference these acute legislators suppose between the laws of Nature and of Nature’s God, is more than I can take upon me to determine, or even to guess. If to what they now demand they were entitled by any law of God, they had only to produce that law, and all controversy was at an end. Instead of this, what do they produce? What they call sell-evident truths. “All men,” they tell us, “are created equal.” This rarity is a new discovery; now, for the first time, we learn, that a child, at the moment of his birth, has the same quantity of natural power as the parent, the same quantity of political power as the magistrate. The rights of “life, liberty, and the pursuit of happiness” — by which, if they mean any thing, they must mean the right to enjoy life, to enjoy liberty, and to pursue happiness — they ” hold to be unalienable.” This they “hold to be among truths self-evident.” At the same time, to secure these rights, they are content that Governments should be instituted. They perceive not, or will not seem to perceive, that nothing which can be called Government ever was, or ever could be, in any instance, exercised, but at the expence of one or other of those rights. — That, consequently, in as many instances as Government is ever exercised, some one or other of these rights, pretended to be unalienable, is actually alienated. That men who are engaged in the design of subverting a lawful Government, should endeavour by a cloud of words, to throw a veil over their design; that they should endeavour to beat down the criteria between tyranny and lawful government, is not at all (121) surprising. But rather surprising it must certainly appear, that they should advance maxims so incompatible with their own present conduct. If the right of enjoying life be unalienable, whence came their invasion of his Majesty’s province of Canada? Whence the unprovoked destruction of so many lives of the inhabitants of that province? If the right of enjoying liberty be unalienable, whence came so many of his Majesty’s peaceable subjects among them, without any offence, without so much as a pretended offence, merely for being suspected not to wish well to their enormities, to be held by them in durance? If the right of pursuing happiness be unalienable, how is it that so many others of their fellow-citizens are by the same injustice and violence made miserable, their fortunes ruined, their persons banished and driven from their friends and families? Or would they have it believed, that there is in their selves some superior sanctity, some peculiar privilege, by which those things are lawful to them, which are unlawful to all the world besides? Or is it, that among acts of coercion, acts by which life or liberty are taken away, and the pursuit of happiness restrained, those only are unlawful, which their delinquency has brought upon them, and which are exercised by regular, long established, accustomed governments? In these tenets they have outdone the utmost extravagance of all former fanatics. The German Anabaptists indeed went so far as to speak of the right of enjoying life as a right unalienable. To take away life, even in the Magistrate, they held to be unlawful. But they went no farther, it was reserved for an American Congress, to add to the number of unalienable rights, that of enjoying liberty, and pursuing happiness; (122) — that is,— if they mean any thing, —pursuing it wherever a man thinks he can see it, and by whatever means he thinks he can attain it: — That is, that all penal laws — those made by their selves among others—which affect life or liberty, are contrary to the law of God, and the unalienable rights of mankind: — That is, that thieves are not to be restrained from theft, murderers from murder, rebels from rebellion. Yet they are about to change a Government, a Government whose establishment is coeval with their own existence as a Community. What causes do they assign? Circumstances which have always subsisted, which must continue to subsist, wherever Government has subsisted, or can subsist. For what, according to their own shewing, what was their original their only original grievance? That they were actually taxed more than they could bear? No; but that they were liable to be so taxed. What is the amount of all the subsequent grievances they alledge? That they were actually oppressed by Government? That Government has actually misused its power? No; but that it was possible that they might be oppressed; possible that Government might misuse its powers. Is there any where, can there be imagined any where, that Government, where subjects are not liable to taxed more than they can bear? (123) where it is not possible that subjects may be oppressed, not possible that Government may misuse its powers? This I say, is the amount, the whole sum and substance of all their grievances. For in taking a general review of the charges brought against his Majesty, and his Parliament, we may observe that there is a studied confusion in the arrangement of them. It may therefore be worth while to reduce them to the several distinct heads, under which I should have classed them at the first, had not the order of the Answer been necessarily prescribed by the order — or rather the disorder, of the Declaration. In all the articles comprised in this head, is there a single power alleged to have been exercised during the present reign, which had not been constantly exercised by preceding Kings, and preceding Parliaments? Read only the commission and instruction for the Council of Trade, drawn up in the 9th of King William III addressed to Mr. Locke, and others.2 See there what (124) powers were exercised by the King and Parliament over the Colonies. Certainly the Commissioners were directed to inquire into, and make their reports concerning those matters only, in which the King and Parliament had a power of controlling the Colonies. Now the Commissioners are instructed to inquire — into the condition of the Plantations, “as well with regard to the administration of Government and Justice, as in relation to the commerce thereof;”–into the means of making “them most beneficial and useful to England; — “into the staples and manufactures, which may be encouraged there;” — “into the trades that are taken up and exercised there, which may prove prejudicial to England;” — “into the means of diverting them from such trades.” Farther, they are instructed “to examine into, and weigh the Acts of the Assemblies of the Plantations;” — “to set down the usefulness or mischief to the Crown, to the Kingdom, or to the Plantations their selves.” — And farther still, they are instructed “to require an account of all the monies given for public uses by the assemblies of the Plantations, and how the same are, or have been expended, or laid out.” Is there now a single Act of the present reign which does not fall under one or other of these instructions? The powers then, of which the several articles now before us complain, are supported by usage; were conceived to be so supported then, just after the Revolution, at the time these instructions were given; and were they to be supported only upon this foot of usage, still that usage being coeval with the Colonies, their tacit consent and approbation, through all the successive periods in which that usage has prevailed, would be implied; — even then the legality of those powers would stand upon the same foot as most of the prerogatives (125) of the Crown, most of the rights of the people, — even then the exercise of those powers could in no wise be deemed usurpations or encroachments. But the truth is, to the exercise of these powers, on many occasions the Colonies have not tacitly, but expressly, consented; as expressly as any subject of Great Britain ever consented to Acts of the British Parliament. Consult the Journals of either House of Parliament; consult the proceedings of their own Assemblies; and innumerable will be the occasions, on which the legality of these powers will be found to be expressly recognised by Acts of the Colonial Assemblies. For in preceding reigns, the petitions from these Assemblies were couched in a language, very different from that which they have assumed under the present reign. In praying for the non-exercise of these powers, in particular instances, they acknowledged their legality; the right in general was recognised; the exercise of it, in particular instances, was prayed to be suspended on the sole ground of inexpedience. The less reason can the Americans have to complain against the exercise of these powers, as it was under the constant exercise of the self-same powers, that they have grown up with a vigour and rapidity unexampled : That within a period, in which other communities have scarcely had time to take root, they have shot forth exuberant branches. So flourishing is their agriculture, that — we are told — “besides feeding plentifully their own growing multitudes, their annual exports have exceeded a million;” So flourishing is their trade, that — we are told — “it has increased far beyond the speculations of the most (126) sanguine imagination.”3 So powerful are they in arms, that we see them defy the united force of that nation, which, but a little century ago, called them into being; which, but a few years ago, in their defence, encountered and subdued almost the united force of Europe. If the exercise of powers, thus established by usage, thus recognised by express declarations, thus sanctified by their beneficial effects, can justify rebellion, there is not that subject in the world, but who has, ever has had, and ever must have, reason sufficient to rebel: There never was, never can he, established, any government upon earth. To state the object of these Acts, is to justify them. Acts of tyranny they cannot be: Acts of usurpation they are not; because no new power is assumed. By former Parliaments, in former reigns, officers of customs had been sent to America: Courts of Admiralty had been established there. The increase (127) of trade and population induced the Parliaments, under the present reign, for the convenience of the Colonists, and to obviate their own objections of delays arising from appeals to England, to establish a Board of Customs, and an Admiralty Court of Appeal. Strange indeed is it to hear the establishment of this Board, and these Courts, alleged as proofs of usurpation; and in the same paper, in the same breath, to hear it urged as a head of complaint, that his Majesty refused his assent to a much greater exertion of power: —to an exertion of power, which might be dangerous; the establishment of new Courts of Judicature. What in one instance he might have done, to have done in another, cannot be unconstitutional. In former reigns, charters had been altered; in the present reign, the constitution of one charter, having been found inconsistent with the ends of good order and government, was amended. Neither in these Acts was any new power affirmed; in some instances only, the objects upon which that power was exercised, were new. Nothing was done but what former Kings and former Parliaments have shewn their selves ready to do, had the same circumstances subsisted. The same circumstances never did subsist before, because, till the present reign, the (128) Colonies never dared to call in question the supreme authority of Parliament. No charge, classed under this head, can be called a grievance. Then only is the subject aggrieved, when, paying due obedience to the established Laws of his country, he is not protected in his established rights. From the moment he withholds obedience, he forfeits his right to protection. Nor can the means, employed to bring him back to obedience, however severe, be called grievances; especially if those means be to cease the very moment that the end is obtained. The last head consists of Acts of self-defence, exercised in consequence of resistance already shewn but represented in the Declaration as Acts of oppression, tending to provoke resistance.9 Has his Majesty cut off their trade with all parts of the world? They first attempted to cut off the trade of Great Britain. Has his Majesty ordered their vessels to be seized ? They first burnt the vessels of the King. Has his Majesty sent troops to chastise them? They first took up arms against the authority of the King. Has his Majesty engaged the Indians against them? They first engaged Indians against the troops of the King. Has his Majesty commanded their captives to serve on board his fleet? He has only saved them from the gallows. (129) By some, these acts have been improperly called “Acts of punishment.” And we are then asked, with an air of insult, “What! will you punish without a trial, without a hearing?” And no doubt punishment, whether ordinary or extraordinary; whether by indictment, impeachment, or bill of attainder, should be preceded by judicial examination. But, the acts comprised under this head are not acts of punishment; they are, as we have called them, this of self-defence. And these are not, cannot be, preceded by any judicial examination. An example or two will serve to place the difference between acts of punishment and acts of self-defence in a stronger light, than any definition we can give. It has happened, that bodies of manufacturers have risen, and armed, in order to compel their masters to increase their wages: It has happened, that bodies of peasants have risen, and armed, in order to compel the farmer to sell at a lower price. It has happened, that the civil magistrate, unable to reduce the insurgents to their duty, has called the military to his aid. But did ever any man imagine, that the military were sent to punish the insurgents? It has happened, that the insurgents have resisted the military, as they had resisted the civil magistrate: It has happened, that, in consequence of this resistance, some of the insurgents have been killed: — But did ever any man imagine that those who were thus killed, were therefore punished? No more can they be said to be punished, than could the incendiary, who should be buried beneath the ruins of the house, which he had feloniously set on fire. Take an example yet nearer to the present case. When the Duke of Cumberland led the armies of the king, foreign and domestic, against the Rebels in Scotland, did any man conceive that he was (130) sent to punish the Rebels? — Clearly not. — He was sent to protect dutiful and loyal subjects, who remained in the peace of the King, against the outrages of Rebels, who had broken the peace of the King. — Does any man speak of those who fell at the battle of Culloden, as of men that were punished? Would that man have been thought in his senses, who should have urged, that the armies of the King should not have been sent against these Rebels in Scotland, till those very Rebels had been judicially heard, and judicially convicted? Does not every man feel that the fact, the only fact, necessary to be known, in order to justify these acts of self-defence, is simply this: — Are men in arms against the authority of the King? — Who does not feel, that to authenticate this fact, demands no judicial inquiry? If when his Royal Highness had led the army under his command into Scotland, there had been no body of men in arms; if, terrified at his approach, they had either laid down their arms and submitted, or had dispersed and retired quietly, each to his own home, what would have been the consequence? The civil magistrate would have searched for and seized upon those who had been in arms would have brought them to a court of justice. That court would have proceeded to examine, and to condemn or to acquit, as evidence was, or was not, given of the guilt of the respective culprits. The Rebels did not submit, they did not lay down their arms, they did not disperse; they resisted the Duke: a battle ensued: some of the Rebels fled, others were slain, others taken. It is upon those only of the last class, who were brought before and condemned by Courts of justice, that punishment was inflicted. By what kind of logic then are these acts ranked in the class of grievances? How this Declaration may strike others, I know not. To me, I own, it appears that it cannot fail — to use the words of a great Orator— “of doing us Knight’s service.”10 The mouth of faction, we may reasonably presume, will be closed; the eyes of those who saw not, or would not see, that the Americans were long since aspiring at independence, will be opened; the nation will unite as one man, and teach this rebellious people, that it is one thing for them to say, the connection, which bound them to us, is dissolved, another to dissolve it; that to accomplish their independence is not quite so easy as to declare it: that there is no (132) peace with them, but the peace of the King: no war with them, but that war, which offended justice wages against criminals. — We too, I hope, shall acquiesce in the necessity of submitting to whatever burdens, of making whatever efforts may be necessary, to bring this ungrateful and rebellious people back to that allegiance they have long had it in contemplation to renounce, and have now at last so daringly renounced. This entry was posted in Uncategorized and tagged Bentham, Declaration of Independence, Edmund Burke. Bookmark the permalink. I think I should point out that this isn’t a politics blog (not that there’s anything wrong with them) but, instead, is concerned with the study of the Enlightenment as a historical period and with later discussions of its alleged project or projects. This post wound up attracting what, for this blog, was an exceptional amount of traffic (though I suspect it’s probably an average day for the Daily Dish or Ace of Spades) and I’ve been having to start flagging comments that drift off into matters that are better worked out on other fora. So, I’m shutting down the comments on this post. Thanks to all of those who stopped by over the last few days, but I need to take the punch bowl away and get back to work. … and, having read the Hart PDF that gwern posted, I can only say that Mr. Bentham was very naive and self-deceiving as to the virtues of democracy and its American implementation; and that a man capable of lying to himself on this scale is of questionable value to anyone else..
A discussion of this sort cannot be complete without mentioning Thomas Hutchison’s “Strictures Upon the Declaration of Independence”. Thanks for sharing this! Bentham is mostly quite wonderful. So few words, so many errors … thank you for catching these! And thanks as well for the Smith quotes. This blog post about Jeremy Bentham’s scathing and totally valid critique of the Declaration of Independence is a must read. I’m sorry I didn’t discover this before the 4th of July. Hart’s article is, like much of his work, quite impressive and well worth reading, not just for what it has to say about Bentham, but also as a reminder of the virtues of utilitarianism written at the moment when the contractarian juggernaut was in full force. Take an example yet nearer to the present cafe [?]. ‘To me, I own, it appears that it cannot fail — to use the words of a great Orator— “of doing us Knight’s service.”’ no idea what this means, even with the footnote. Thank you for catching these errors! (and thanks, as well, to Michael Rosen for catching others). I fear there are many more. Here, as had been the case in my earlier posting of texts from the German Museum, my initial draft was produced by running OCR software on the scanned copies available at Archive.org. But, as anyone who has tried this probably knows, there was a sea change in English typography between 1776 and 1800. While the texts from the German Museum could be converted with very few errors, the conversion of Lind’s book made considerably heavier demands. The most predicable error involved the presence of the long s, which the OCR read in a variety of ways. Also, the scan on Archive.org was not as clean as their scans of the German Museum. Thanks as well for your query regarding “Knight’s service.” I’ve tracked it down and added a few editorial notes that (drawing on E. J. Payne’s editorial note) tries to shed some light on it. I think it is clear that Bentham’s quotations from Burke are laced with irony (for once, Burke is getting as good as he gives). Before you take the plunge, I should mention that several decades later Bentham had a more charitable assessment of the US (though he continued to think the Declaration was less that convincing). Hart discusses this in the article I mention. Good Lord he’s right. Elizabeth II, I’m yours.